Man United were held 0-0 against Valencia on Tuesday night in a frustrating Champions League stalemate. Jose Mourinho during his side's Champions League meeting with Valencia. 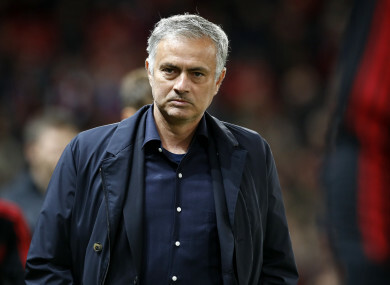 JOSE MOURINHO RISKED causing another rift with his Manchester United stars as he slammed his defence’s lack of “technical quality” after their 0-0 draw with Valencia. The frustrating Champions League clash at Old Trafford means Mourinho’s side have gone four games without a win in all competitions. United rarely looked like scoring against their out-of-form opponents and were booed off at full-time. It was another blow for Mourinho, who has come under fire after presiding over United’s worst since to a league season for 29 years. Mourinho has feuded with star midfielder Paul Pogba, as well as other members of his squad. And now he has taken a swipe at his back four, which against Valencia featured Antonio Valencia, Chris Smalling, Eric Bailly and Luke Shaw. “We don’t have the technical quality to build from the back,” Mourinho said. “The players tried. They raised the level of their intensity in spite of the fact we don’t have many with that intensity. Mourinho admitted United had focused on stopping Valencia causing them problems, even though they were at home, because his team are so badly lacking confidence at present. “We tried to do something we did well which was to stop a fast team on the counter attack. We knew we wouldn’t create 20 chances,” he said. “Our attacking players aren’t in their best moments of confidence and individual level. We thought with three or four chances we would score and win the game. “It is a not a bad result. Not a good result, but not bad. We have two matches against Juventus to make points. It is a very difficult group, yes. Email “'We don't have technical quality': Mourinho admits United problems following Valencia stalemate”. Feedback on “'We don't have technical quality': Mourinho admits United problems following Valencia stalemate”.